There have been several different types or models of spiritual direction throughout the centuries. Some of us, especially those of us who have read the lives of the saints, have various ideas of what spiritual direction has entailed in the past. There have been relationships of spiritual guidance similar to father/son, teacher/student, master/servant, and confessor/penitent (such as is still common when spiritual advice is given in the confessional). There were also examples in the lives of the saints of spiritual friendships. Modern spiritual direction most often refers to a relationship which is more like spiritual companionship or friendship where the director is present as a spiritual friend who listens with the intent of helping the directee recognize how the Holy Spirit is leading and working in one's life. The emphasis is on helping the directee develop a good prayer life and relationship with God. The director does not tell the directee what to do in a way that requires obedience. The directee has the final decision as to what to do in her spiritual life. Questions are asked to get to know the directee, her present life circumstances and spiritual life. The goal is to help the directee to discern how the Holy Spirit is personally leading, recognizing that God has a special and distinct plan for each person's life and everyone is not called exactly the same way. In this sense, there are no better or worse callings or vocations, as the best calling for an individual is God's plan for that person in particular no matter what it might be. Like scripture says, there are many members of the body and all are good and necessary. The idea is to determine and encourage the directee to be the unique person that God made them to be, doing the things that God is personally asking of each of us. While God has a unique calling and plan for each person and gives individuals different talents, gifts and vocations (and trials and sufferings) as just described, there is also the recognition that God has certain standards and principles that apply to everyone. Jesus gave us a way to know these truths when He founded the Catholic Church to spread his message. Jesus told the apostles, "Whoever hears you, hears me." This still applies today to the pope (and bishops) who are direct successors of the early apostles through the laying on of hands throughout the centuries. He promised to remain with the Church until the end of time and to send the Holy Spirit to lead until all truth. He gave us the Bible which is the inerrant Word of God. He also gave us various saints to teach us how to be closer to God especially saints who have been spiritual directors themselves such as St. Teresa of Avila and St. John of the Cross. For information on personal spiritual direction through e-mail click here. "The life of a Christian, like God's own life, must be essentially love: first of all, love for God, the infinite good, and then love for all... True love of God consists in adhering perfectly to his holy will, not wanting to do or be anything in this life but what the Lord wishes... The more a soul does, and enjoys doing, the will of God, the more perfect and holy it is." -- from "Divine Intimacy" by Fr. 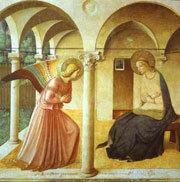 Gabriel of St. Mary Magdalen, O.C.D.